The objective of the Personal Introduction is to get answers to your general questions on retirement planning, investments, taxes and insurances; learn the differences between investing and financial planning, and determine if the Feller Road Map can benefit you. The Discovery Session is a consultation with a Feller Financial Advisor to clarify your values, goals, current financial positions and to identify ideas to improve your current plan. Also, you will have the opportunity to experience a time tested financial planning process that can help you make smart choices with your money and stay on track to your goals. 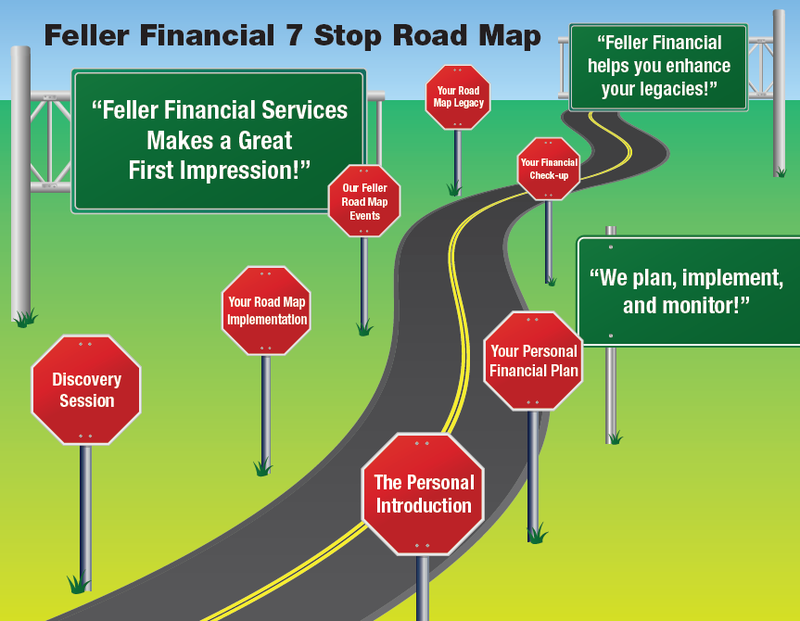 The objective of following the Feller Road Map is to give you the confidence to help make the right choices to reach your goals. This Plan is an active illustration using current financial tools and our experience that maps out what items you should consider to bridge the gap from where you are now to where you need to be in each of the areas of cash reserves, investments, debt and insurances. The objective of the Road Map Implementation is on our part to make sure all your assets are properly positioned to be on track in working towards meeting your goals. Furthermore, we take the time to familiarize you on how to access your online performance reports, setting you up for eMoney and more. The objective of your annual or semi-annual Financial Check-Up is to help build confidence that you are on track towards your goals. In addition, we update records for new information, answer any financial questions, review investment allocation, taxes, performance, discuss additional investments and withdrawals, follow-up on open action steps and make any other necessary adjustments. We host annual client events (including dinners, wine-tasting, lunches, etc.) to celebrate our clients’ achievements, share experiences and ideas about their goals. Every quarter we host three seminars dealing on financial subjects including Social Security, Healthcare, Retirement and much more. We want to make sure your goals stay on track no matter what is going on and in unforeseen circumstances that your heirs stay taken care of. Your hard work and success is transferred to your loved ones or charities in an orderly fashion.